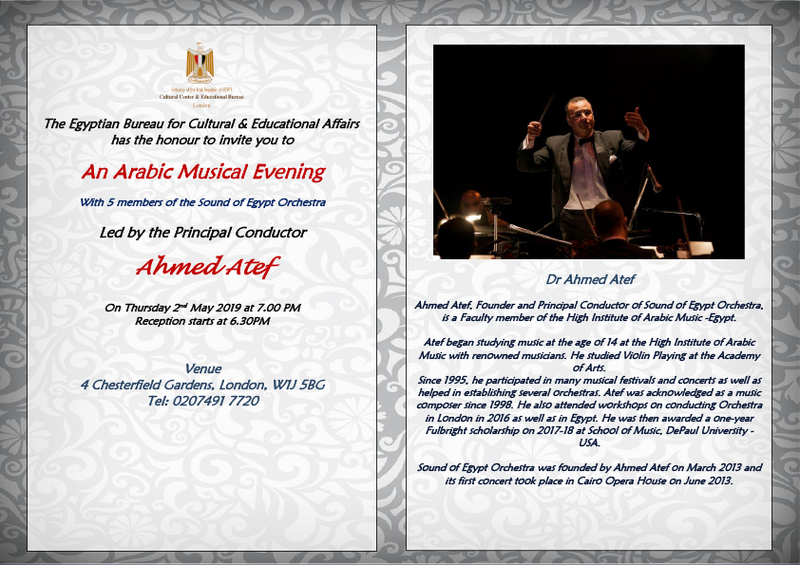 “An Arabic Musical Evening”, a musical evening by members from the Sound of Egypt Orchestra. Dr Ahmed Atef Ahmed Atef, Founder and Principal Conductor of Sound of Egypt Orchestra, is a Faculty member of the High Institute of Arabic Music -Egypt. Atef began studying music at the age of 14 at the High Institute of Arabic Music with renowned musicians. He studied Violin Playing at the Academy of Arts. Since 1995, he participated in many musical festivals and concerts as well as helped in establishing several orchestras. Atef was acknowledged as a music composer since 1998. He also attended workshops on conducting Orchestra in London in 2016 as well as in Egypt. He was then awarded a one-year Fulbright scholarship on 2017-18 at School of Music, DePaul University – USA.